World Cup 2014 – Starting with a Whimper. Almost without notice, the qualifying trail for the 2014 started last Wednesday (15 June 2011). The opening game was played at the Ato Boldon Stadium in Couva on the Island of Trinidad. However, Trinidad & Tobago was not one of the countries participating in the opening game. The match was played here due to the fact there is no suitable stadium on the Island of Montserrat. Montserrat is a small, British Overseas Territory in the Caribbean, and had a population of under 6000 before it was devastated by volcanic eruption in 1995. That means its size is about one third of that of the Isle of Wight, but since the volcano, an exclusion zone covers the southern half of the Island, including the capital Plymouth. Around half the original population has left, either to other Caribbean islands or to Britain, (quick as a flash in an emergency, Britain granted right of abode to those from Montserrat three years after the disaster struck, and citizenship four years later). Not surprisingly, Montserrat were beaten in the game, losing 5-2 to Belize. Belize are ranked 172 in the World. With the bottom ten of CONCACAF’s 35 members in this knock out qualifying round, Belize are the only non-Caribbean side at this stage. Deon McCauley, who at the age of 23 has already played football in Costa Rica and Honduras, as well as his native Belize had the honour of scoring the first goal of the 2014 World Cup. He went on to complete a hat-trick. This is not the end of the story. There should have been a second leg match in Belize four days after the opening game, after which Montserrat could be named as the first side knocked out of the 2014 World Cup, but a combination of the government of Belize and FIFA intervened. Even before the match, the government of Belize had stated that the Football Federation of Belize (FFB) were not a properly registered association and could not officially represent the country. This dates back to the last election for the FFB executive and president in December. After the election, the government set up an “independent” Sports Investigation Committee. The sports minister has been quoting from an as yet unpublished report, which apparently says that by refusing to accept nominations from one of its members (the Belize Premier Football League, the country’s leading league),the FBB had broken its own rules. With the alternative candidate banned, the incumbent, Bertie Chimilio had a free run, but anyway he also handpicked the district representatives who were responsible for voting him back in. A standoff between the government and the FFB appears to have been going on throughout the year, and FIFA who are notorious unfriendly to governments who interfere in footballing affairs,( with the obvious exceptions of dictators like Gaddafi), gave Belize a deadline before its recent congress, to sort out the situation by the end of the month of June. This deadline would, of course have allowed the two qualifying matches to take place, and give Belize a short window to sort the situation out before the next international match. It was the government of Belize which took the step that brought proceedings to a halt. They wrote to FIFA in the week before the Montserrat match to state that the FBB did not have the right to represent the nation, and could not fly the Belize flag or play the Belize National Anthem at the match. These symbols are considered to be important, when in the qualifying rounds for the 2010 World Cup, North Korea refused to allow the South Korean flag or National Anthem to be used at matches between the two Koreas in their part of the peninsular  the matches were switched to neutral China. The North Koreans did play in South Korea as scheduled. Anyway, the match in Trinidad last week went ahead, even without the sanction of the Belize government, but faced with a letter saying that the Belize government would not provide police or security for the match, FIFA finally intervened and suspended Belize from World Football on Friday. Citing Government interference, FIFA have said that any action taking by the government against the office bearers of the FFB would not be recognised. Meanwhile, a new association has been formed in Belize, the National Football Association of Belize, and on Saturday it elected its first President. Representatives of all the district associations in Belize were present, along with those from the Belize Premier League and the Super League of Belize. With the exception of the Super League, these are the same groupings as would have voted for the FFB president, (not necessarily the same representatives of those associations). The vote was won by Michael Blease, but no list of alternative candidates has been mentioned. The Super League appears to be a rival league to the Premier League, but not registered with the FFB. This appears to have been the case for some time, although the FFB have not been taking normal action against an unaffiliated league, as McCauley, the hat trick hero from the opening game is a player with Super League champions, City Boys United. One would normally expect a player with an unaffiliated league to be excluded from international participation. FIFA have given Belize only until 10th July to sort out the situation and play the match. It seems this is not good news for Belize, as neither party is close to giving ground. A similar situation involving Brunei was only recently resolvedafter 18 months of suspension from FIFA. In the end, the newly formed National Football Association of Brunei Darussalam was allowed to take over, (which means that FIFA did give in to the local government), although I understand that FIFA are pretending otherwise. Assuming Belize are suspended, they may not get any thanks from Montserrat if the island gets a bye into the group stage. While it is great for even a small nation to be involved in the World Cup in a small way, it would be a mistake to say they want to go beyond the first match. The top six CONCACAF nations are exempt from the first group stage, so if they get through, Montserrat will have to bear the expense of a six match group with little income from their home games (the game last week had a crowd shown as 100 by FIFA). FIFA have plenty of money to spread about, but they do not use it to support teams in playing their qualification games. FIFA do not always back officers of National Associations against their governments, as one can see from the situation in Indonesia. Since 2004, the Indonesian Football Association (PSSI) has been run by Nurdin Halid. Halid is a controversial character in Indonesia, and has been charged with corruption for his business activities on several occasions, and has suffered two jail terms during his tenure as PSSI president. At the beginning of the year, another business man, Arifin Panigoro set up his own football league in competition to the Indonesian Super League. The Indonesian Premier League started in January with many of the country’s top clubs running teams in this, although under different names to those operating in the PSSI supported league. FIFA did back the PSSI against the rebel league, and promised to enforce bans on players in the league from International football, (so unlike the situation in Belize there). Still, FIFA had threatened to suspend Indonesia from International Football because the government had interfered by appointing a commission to look into corruption within the PSSI. However, since then, FIFA have had a change of heart and decided that the status quo cannot be supported. Sometime around March, FIFA decided they had rules preventing a convict from being a National FA President, but they have also banned Panigoro and two other candidates. With the election of new officers twice delayed by the PSSI, FIFA gave the PSSI until June 30th to elect new officers or face suspension. The June 30 deadline has been relaxed by FIFA after the PSSI realised that its intended election could not be held, as they had not given the electors 28 days’ notice. The election should take place on July 9th, with FIFA’s deadline to avoid suspension being 10th July. This should allow Indonesia to play their first World Cup qualifying match, scheduled in Turkmenistan on July 23rd. Anyway, it will be Asia that gets the “honour” of the first teams knocked out of the 2014 World Cup, and they will also lose the most teams in Preliminary Rounds before the main draw takes place on 31st July. There are eight Asian qualifying matches on 29th June, with the first second leg on July 2nd. This match is between Timor Leste (aka East Timor) and Nepal and is being played in Kathmandu. Timor Leste, like Montserrat does not have suitable ground at home, but have reached the dizzy heights of 200th in FIFA rankings, thanks to a draw in Cambodia in 2008. Seven more Asian teams will be knocked out on July 3rd; four Concacaf teams (apart from Belize or Montserrat) will fall during July, followed by another 15 Asian Teams from a second round at the end of the month. Of FIFA’s 208 members, Mauritania, Guam and Bhutan did not enter, and Brunei could not enter due to their suspension not being lifted until after the local draw had been made. 28 teams are scheduled to be knocked out before the 31st July draw. 175 countries will be in the draw, while Brazil is exempt to the finals as hosts. ASIA  43 out of 46 members participate. 23 knocked out in two qualifying rounds by the end of July. The surviving 20 go into five groups of four (six games each). Ten teams go through to round 4, where they are placed in two groups of 5 (eight games each). Winners and Runners-up from these groups go to Brazil. Third placed teams play each other, with the winner in an inter-Continental Play Off. Qualifiers will play a minimum of 14, but as many as 22 games to reach Brazil. CONCACAF  35 Participants, of which five are knocked out in the first round. The second round involves 24 clubs (six exempt) in six groups of four. The six winners and six exempt teams go into four groups of four. Six teams (winners and runners up) go into a fourth round which is a group of all six (ten games each). Three make it to Brazil, and one goes into a play off. If exempt in the first round, a qualifier would still play 14 games. If one of this month’s winners gets through on the Play Off, they will have played 22 times. Oceania  11 participants, but non FIFA members Tivalu and Kiribati also take place in the Pacific Games which makes up the first stage. This is the only confederation that does not play home and away, but 10 countries (not including New Zealand) play in a tournament in New Caledonia. They three qualifying from this will have played six games. These three play with New Zealand in a home and away group (six matches) with just one Champion going into an inter-Continental play off. The winners are also Confederations winners and play in the 2013 Confederations cup. COMNEBOL  The most straight forward. Brazil are exempt, and the other nine matches play a league (16 games each) with the top four going through and the fifth team in a play-off. UEFA  Europe has 53 participants. The teams are divided into nine groups. Eight will have six teams (10 games), while one will have just five (8 games). The winners all qualify, so one team will qualify after just 8 games. All but one of the second placed teams play off for four extra places, these are European only play-offs. One unlucky second placed team does not get a second chance. For political reasons, Armenia cannot play Azerbaijan, and Russia cannot play Georgia. After less than an hour crammed into the back of a Fokker propjet, I made the transition from Latvia to Lithuania. My plan, based on advanced checks on the fixtures was to see the only A Lyga game on the Tuesday, when Dainava played Tauras in a mid-table match, and then to follow this with the top two Zalgiris v Ekranes. I still had not decided on arriving in Riga whether to hire a car or to use buses and stay overnight in Alytus after the Dainava game. In the end, my decision was made for me. While I was in Riga, I discovered that the fixture detail had been changed during the week before the matches, and my favourite Wednesday game, Zalgiris  Ekranes game was not to be played in the capital, but in Marijampole, a two hour bus ride away. This meant there was no public transport from there (or any other game) suitable to return me to the capital in time for my 6.30 flight on Thursday. And so on arrival at the airport, my first job was to check car hire prices. A local company offered me three days for around £100, and knowing that Hertz, operating out of the next office bar one were charging almost twice as much, I took it straight off. Now comes the bit where modern technology really helps. Instead of trying to read a map and drive in an unknown country, my SatNav found the route to the hotel straight away. Still, it took some time after spotting the road, in a rather run down suburb, to find the hotel  which turned out to be ultra-modern once one entered. Clean, bright, spacious and while the breakfast did not add to much, the internet worked. It took only ten minutes to walk to the town centre. 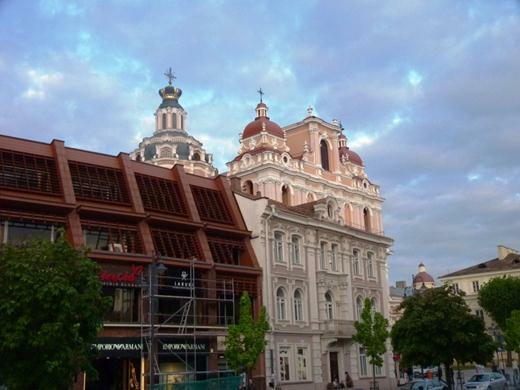 Vilnius is larger than its rivals in Tallinn and Riga, and very well preserved. There are more churches than you could worship at in a month of Sundays. The country is predominantly Catholic and signs in the city centre commemorated a visit by Pope John Paul II in 1993. I managed a good walk around before the sun went down, and then entered a local establishment that provided a very palatable wheat beer, as well some food. Vilnius Cathedral  one of many churches in the Capital, although not typical of the local style! There is a strong but friendly rivalry between the three Baltic nations, all of which left the Soviet Union in 1991 and joined the European Union (and NATO) in 2004. I believe all three would like to embrace the Euro, but progress has been slowed by the recent economic crisis, which has put a halt to recent growth. There is one significant difference, Estonia and Latvia have never been other than small countries trying to fend off (not always successfully) the superpowers of the region, Sweden, Russia, Poland and Lithuania. Lithuania (as part of a shared commonwealth with Poland) was the power in central Europe from the 15th to 18th centuries. The Grand Duchy of Lithuania included the current states of Belarus, Ukraine and Moldova, as well as parts of other states such as Romania, Poland and Russia. Even now it is larger than either Latvia or Estonia in terms of area and population  the three together have about one and a half times the population of Scotland, in an area which is almost twice the size of Scotland. I know the standard comparison unit is normally Wales, but I feel Scotland needs some recognition. The local rivalries extend to the football field, and the trio have created a number of cross border challenges, which are almost completely ignored by the local populations. The three day, three match triangular tournaments are a favourite, even though these can never give the best of football. These are biased in favour of the home team, and the last two were won by the home team. Lithuania won a international series held in Kaunas last June, while Skonto won the champions completion, held at their indoor arena (which includes a full sized pitch) in January. The tournament total attendances were not exactly spectacular. The three games in Kaunas totalled a crowd of around 2000, whereas only 500 people headed to the Riga tourney. 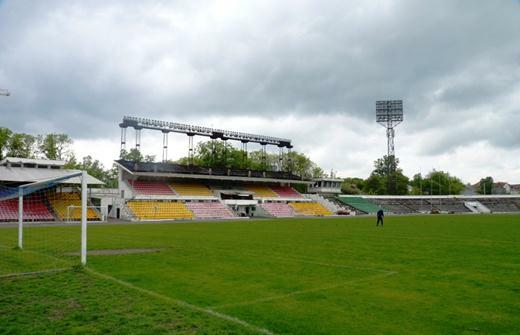 The Zalgiris Stadium in Vilnius, although not currently in use, the pitch looks worn, and there is a groundsman working on it. In ranking terms, Lithuania lead the way  they are ranked 54 by FIFA, ahead of Latvia (75) and Estonia (82), while UEFA rankings for clubs places Lithuania in 32nd , Latvia one lower, and Estonia 43rd. This gives all of them four entries in European competition, and all starting at the same stages. (Wales are 46th, Northern Ireland 49th). This is also reflected in attendances  the Estonian League has (according to European Football Statistics) an average “crowd” of just 188 in 2010, Latvia had 448, while Lithuania gets 880. So Tuesday morning arrived, rather dull and damp, and making me pleased to have explored the city centre in the previous evening’s sunshine. Fortunately, conditions improved allowing me to make the drive to Alytus in reasonable weather. The countryside was a mixture of woodland and agricultural land, but little of any great interest. At no point did I feel compelled to stop and admire the scenery. As for Alytus, it would be easy to dismiss it as an ugly town, but this is a little unfair. It is bland and apparently uninteresting, but has a saving grace in the form of a large expanse of parkland that comes right into the centre of town, keeping the regulation apartment buildings at bay. Within this area is the Alytaus miesto Stadionas. (The extra “a” in the place name is correct, and I assume is possessive), miesto Stadionas means Town Stadium. What one gets is a very neat, and very new (it replaces another stadium on the same site). The press offices told me that it now holds 3700 seats, with two stands each the length of the pitch  a larger covered one on one side, and a lower open area opposite. The ground boasts the almost obligatory athletics track, with no facilities at either end. Neither stand has any elevation, so at least 10% of the seats are best avoided as too low. This probably ranks the stadium only behind the new stadium in Marijampole as the second best in the country, and during the week before my visit, it had the honour of staging the National Cup final. The team name Dainava refers to an area within the city of Alytus. The visitors were Tauras, from the city of Taurage. This appears just to be a contraction of the town name, taking the local spelling for a zodiac sign and naturally using a bull on their badge. 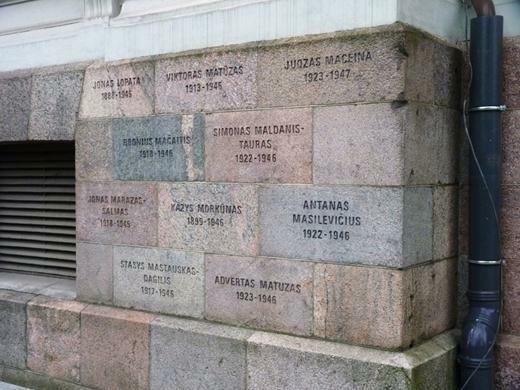 It appears that the city names are rarely included in the club’s official names here, although Klaipeda, Mazeikiai, Siauliai and Kaunas are all just place names. Suduva is the area which includes Marijampole. Zalgiris is the local name for the major battle that cemented Lithuanian power early in the 15th century (English history books would refer to it as the Battle of Grunwald). Unlike in Latvia, people were allowed to smoke in the stands, and there was a beer tent at one end providing lager and dark beer, as well as soft drinks. No food, tea or coffee though. The crowd was the best of the tour, and if the official figure around 2000 is correct, then it just about eclipses the total of the other five games seen in Latvia and Lithuania. Admission was 5 lita for any part of the ground, with the majority taking cover, but the “ultras” from each side settling for the end sections of the open area. As for the game, it was of pleasantly good quality, certainly better than anything I had seen during the Latvian part of the tour. The visitors had an assembled a squad including a number of foreigners, and the name that stood out was Seedorf. Sadly this was Regilo Seedorf, and I suppose the fact he plays in the Lithuanian League, having tried his luck in the Netherlands, Belgium and the Cypriot second division gives away that he is not quite as good as his Uncle Clarence. While Seedorf was trying to run the midfield, it looked as if the game could go to Dainava, but as soon as Tauras decided to miss the centre of midfield and play the wings, the game changed in their favour. The opening goal came seven minutes before the break, when Borisovs played down the left wing and crossed the ball for the right winger, Buitkus to finish. The home side levelled the scores direct from a free kick early in the second half, but never looked likely to capitalise on this. Instead most of the second half seemed to be a series of fouls on the visitors wingers. The inevitable happened with 15 minutes to play, as one of the series of yellow cards collected by Dainava was a second, and substitute Strauka left the field early. With three minutes to play, a splendid passage of play involving all three of the Tauras substitutes resulted in a winning goal. One player ran with the ball, passed it out to the left wing, and then the cross was met by a good header which looped over the home keeper. Heading back overnight to Vilnius allowed me to start again the following day, even though I would be repeating my steps to a large extent. It did allow me to enter the museum of the genocide victims, otherwise known as the KGB museum. On the two upper floors, this consisted of a highly politicised view of the resistance against first German and then Russian occupation of the country from 1940 to 1991, and the lives they lived if caught and deported . It is the basement, however that holds the power to shock. This is a dank prison, almost unchanged since the Soviets left in 1991, and was there place were the regime first took those who offended it for interrogation and imprisonment, before shipping them to Siberia, or simply executing them within the building. (No photos permitted), but the outside of the building is now engraved with some of the names of those killed. While my trip to Marijampole covered many of the same roads as the previous day, I started earlier, and this allowed a stop in Trakai. Here an interesting and picturesque castle sits in the centre of a lake. The building has been restored and the new red brick stands out starkly against the older parts of the building. 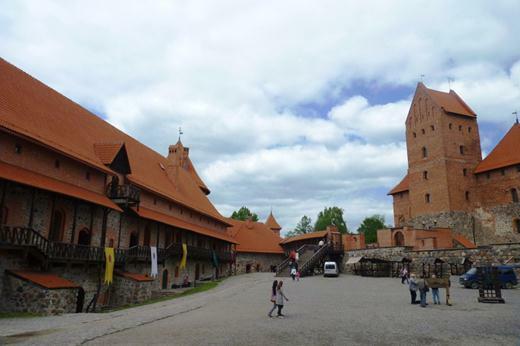 The oldest parts of the castle date back to the 14th and 15th century, but it fell into disrepair after the battle of Zalgiris. Just not needed when peace ruled! The modern restoration was carried out mainly in the 1950s. 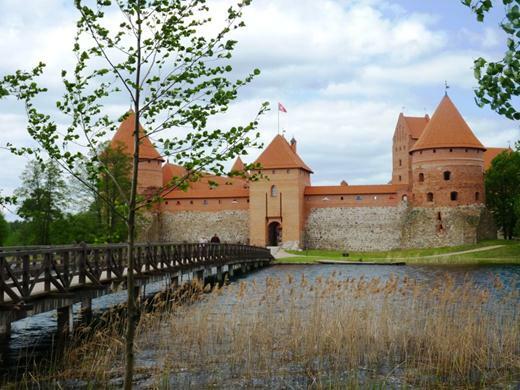 Trakai Castle  restoration in redbrick! 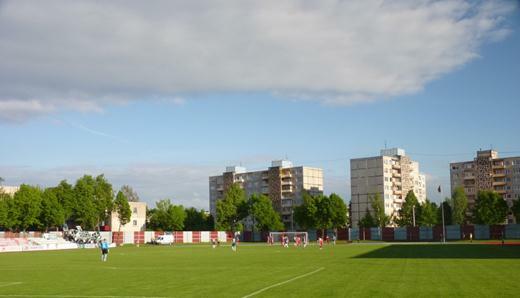 Marijampole may be the current host of Lithuania’s national team matches, but it is not an exciting city. The town centre consists of a sterile concrete square and a couple of supermarkets. The two football grounds are situated to the north of the centre, only around 400 metres apart. 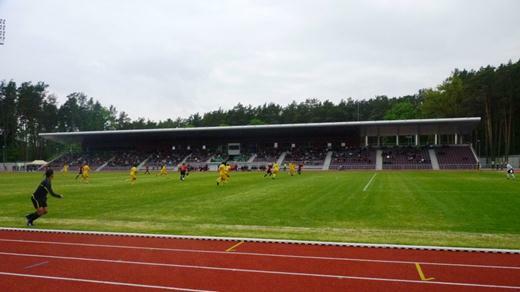 Suduva used to play at the Suduvos Stadionas, before moving to the new stadium when constructed in 2008. The new stadium seats 6250 and originally had the same name as its predecessor, before naming rights made it into the “Avri” Arena. The older ground was similar to that visited the day before, older and slightly larger, but still a main stand along one side, and a low bank of uncovered seats opposite, and nothing but the track at either end. No admission was charged, and the “home” fans were provided with a free coach from the capital, but still I estimated the attendance at just 150, (officially it was 500). I chose the game as it was the “big” game  both sides could end the day top of the league, and also because there may be few chances to return and visit this stadium. Zalgiris’ travelling support (for a home game) try to get behind their team. In the short term, this does not seem to mean much. Not only have Zalgiris to play more games here, but also FBK Kaunas had switched their game for the following Sunday. While it was easy to discover that Zalgiris had a problem with their home stadium being considered unsuitable for a A Lyga license, and the planned new stadium being still on same drawing boards as it was on 10 years or more ago, the reasons for other matches moving was unclear. 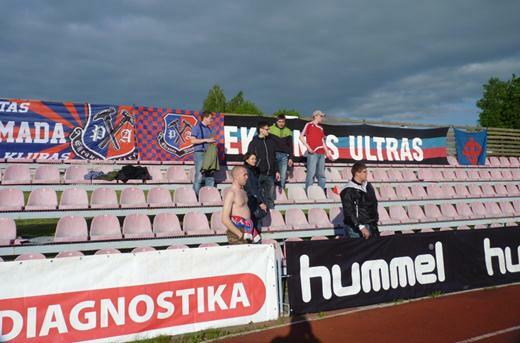 Meanwhile, the travelling Ekranes Ultras try to look menacing. Meanwhile, Suduva were actually supposed to be away to Atlantas in Klaipeda, but had switched to playing at home, and kicking off 90 minutes before the Zalgiris game. This was an annoyance to me, who would have doubled up had the matches been two hours apart. Indeed there may have been some local sympathy for my position. Some 30 or 40 people entered the ground around half an hour after kick off, many wearing Suduva colurs. 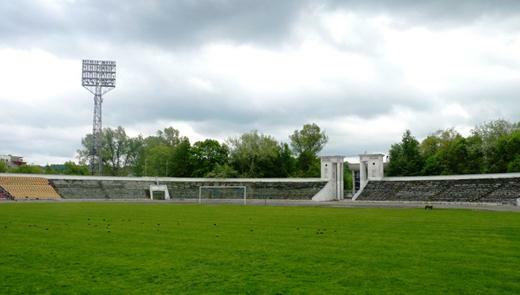 I could not find out why Kaunas, who have played their other games in their home city were to switch a game here. It cannot be for the crowds though Dainava appear unique in getting 2000 in for their mid table games. The others are all under the 1000 mark. 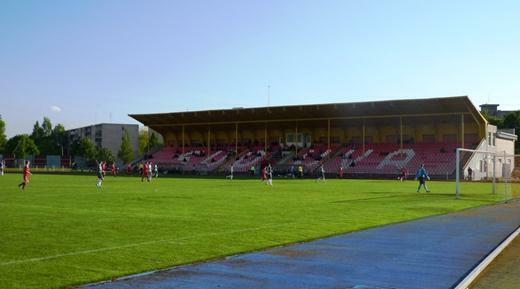 As for my game, it was settled by an early goal scored by Ribokas for league leaders Ekranes. After this, Zalgiris seemed to be able to command most of the play, and unleashed plenty of shots, but hardly any that were anywhere near the target. With the early goal secured, the visitors were content to defend deep against opponents that seemed to lack any sort of punch. Their own attacks were rare, but were more concise and precise. Ekranes were always good to hold on to their lead, and the game finished 1-0. Most of the play was uninspiring, and it was a surprise when Austraukas of Zalgiris managed to get himself a red card a few minutes before time. I did not think anyone was going to be committed enough to make a serious foul. I travelled back using the motorway route, through Kaunas soon after dusk, but early enough to see it has a small historic centre and may be worth a visit on another trip. I managed to sleep a little in a quiet service area, and hence delayed arriving in the capital until around 3 am, heading straight to the airport for my 6.30 flight. You are currently browsing the Football Shaped blog archives for June, 2011.